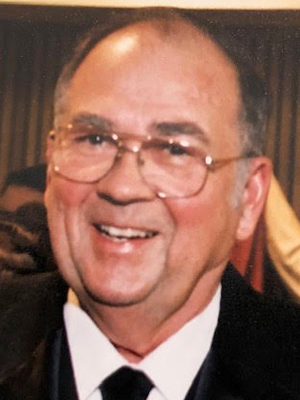 Robert “Bobby” Mertens, age 83, a longtime resident of Prior Lake, MN and Cross Lake, MN, passed peacefully with his loving wife at his bedside, at Augustana Emerald Crest, in Shakopee, MN. He fought a good fight with Lowy Body Dementia. Bobby’s life will be honored with services all held at St. Michael Catholic Church 16311 Duluth Avenue SE, Prior Lake. A visitation will be Wednesday, February 6, from 3-7 pm and Thursday, February 7, from 9:30-10:45 am, with a Mass of Christian Burial, at 11 am. Father Xavier Goulet will preside. Pall bearers will be dear family and friends of Harold Beckman, Jim O’Keefe, George Colling, Joe Wise, Bernie Mahowald and Mark Monnens. He will be laid to rest at St. Michael’s Cemetery, with fire department honors provided. Memorials are preferred and will be distributed in Bobby’s memory, by the family. Born the middle son of three, Robert Dale was welcomed by parents Cecil and Vera (Colling) Mertens. He was born in the family cabin, on Spring Lake, on August 21, 1935. Bobby’s family later moved to Jordan, MN, where he and others often found mischief following them. Enjoying his roots in Spring Lake, Bobby rode his bike countless miles back and forth. He attended St. John’s Catholic School. During high school, Bobby worked for Strait Funeral Home, with graduating from Jordan High School in 1953. While attending a dance at the Spring Lake Pavilion in high school, Bobby was introduced to a beautiful young gal named Carole Monnens. They became friends and started courting. On October 1, 1955 at St. Michael Catholic Church, in Prior Lake, Bobby and Carole wedded and later welcomed seven children. Carole’s father built them their first home in Prior Lake. Her father had also started a successful lumber company, “Monnen’s Lumber Supply.” Bobby began working there and later took over the business. He was so proud of the positive effects it had on the community. Bobby was the first up town in the morning to welcome people on the streets. Through the years, his pickup was an iconic symbol making his way around town. He retired and passed on the business to his sons, but Bobby really could never retire. He continued to go to work, greeting his customers and assuring his son, he was running the business correctly! Bobby was grained into the community and very civic minded. He was always looking for ways to benefit the community. Bobby developed and built the Prior South Community. He was instrumental implementing the Scott County 911 program. Bobby proudly served his community volunteering first for one year on the Jordan Fire Department and then for the Prior Lake Fire Department for 23 years, with 13 years as Chief. He and Carole participated in the Prior Lake Players and they also were huge supporters of St. Michael Catholic Church and School. From 1967 – 2014, Bobby and Carole raised their children and welcome grandchildren and great-grandchildren to their home on Prior Lake, in the Willows. Countless hours where spent as a family enjoying the summer and winter activities the lake provided. In 1993, Bob and Carole purchased a cabin in Cross Lake, MN, which also became a landmark for friends and family. Although Crosslake is only 150 miles from Prior Lake, Bobby said “it should never be traveled to in less than eight hours”. As a couple, they loved to travel, playing cards with the Credit River card group and entertaining. Bobby even dappled in deer hunting. Bobby lived a simple life. He was committed to his family and community, by leading the fire department and being a local business owner. Bobby was honest, hardworking, loved to socialize with people and enjoyed watching Main Ave from the window of the Lumber Yard. He will be forever missed by wife, Carole: children, Kerry Wedin, Kelly Mertens, Paul Mertens, Tess (Lee) Mertens Johnson, Greg (Jenny) Mertens, Joe (Shari) Mertens, Amy (Ryan) Jurek; grandchildren, Brandon Bartlett, Krissy (Paul) Esser, Lindsey (Chad) Hallett, Alissa (Chris) Gram, Alexa Mertens, Jonathan Mertens, Jacob Mertens, Kaylee Mertens, Emelia Mertens, Teagan Jurek, Reese Jurek; great-grandchildren, Emily Bartlett, Kelli Allison, Leah Esser, Camden Esser, Lewis Hallett, Hannah Hallett, Harper Hallett; sister-in-law, Carol Mertens; other family and friends. There welcoming him home in heaven is infant son; grandson, Blake Johnson; parents Cecil and Vera (Colling) Mertens; brothers, David (Betty) Mertens and Wayne Mertens. Ballard-Sunder Funeral and Cremation proudly served and cared for the Mertens family. Carol and family – You are in our prayers. What a lovely man and neighbor to Billy and Larry Sheehan and family. Rest In Peace Bob and I am sure the rest of the St. Mike’s family are embracing you in heaven. God bless from the Sheehan girls, Deb, Joni and Annie. Sending love from the Royal Nelson family. What a wonderful man he was. Thank you all for his many years of service as a fireman for our community for many years. Thanks for your great friendship with our family. He and Mom are having a toast in heaven. Hugs for every single one of you…. Bobby was always one of those people you know will bring brightness to your day and a smile to your face! Always a fun and caring friend! I know Brent had great respect for him as fire chief, fellow firefighter, and friend. He will be missed but will remain in our hearts forever. Our condolences to the Mertens family from Arizona. We are talking about all the times we shared along the Main Street of Prior Lake and all the visits to eachothers businesses. Our thoughts are with you as you go through these hard days. Our thoughts and Prayers go out the the Merten’s family. Bob was a great guy. His legacy will live on in Prior Lake forever. So sorry to read this. We had great times with Bob and Carole. Those memories will never be forgotten. If we weren’t in Arizona, we surely would have been there. Condolences to the whole family. RIP Bob. Until we meet again. Our thoughts & prayers go out to you Carol & to the rest of the family! He was a great guy! So Sorry for your loss. I have so many fond memories of your parents …Prior Lake legacy. Thinking of your family in this difficult time and wishing you peace. Prayers to the whole Mertens clan during this hard time. I have so many fun memories growing up with you guys in the Willows and seeing you about town in Bobby’s truck! Not only is the community of St Mikes grieving with you, but the town of Prior Lake as well. Hugs and prayers for all of you. Sending prayers to the Merten’s family. Bob was a great guy who always had a smile on his face! My sincere condolences to the whole family. Bob always had a smile for everyone. He will be missed. Carol, My sincerest sympathy to your family. May Bob Rest In Peace, and may you, your family and friends, find comfort in celebrating memories of him. Bobby was in so many ways “Mr. Prior Lake.” He and his red truck helped us on more than one occasion to move a large piece that wouldn’t fit in our car. I still miss seeing him drive by in that red truck with his name proudly declaring his ownership. He will be missed but more importantly he will be remembered . Carol and Family, my Deepest Sympathy to you all. So sorry to hear of this. So many many fond memories, Bob was certainly one in a million!! Hold close all those fond memories, during this time of sorrow. Prayers to you all. To Carol and the Mertens family, we’re so sorry to hear of the loss of your beloved husband and dad. We enjoyed seeing Bob in his red truck over the years, mostly going into work or on his way home. So dedicated. Wishing your family peace and love. Your Willow Beach neighbors. So very sorry to hear of the passing of your Dad. You were always so proud of him and by reading his obituary we can certainly understand why. Sending our hugs and prayers to you and your family. To Carol and the Mertens family, Bobby was a good friend. He made the Police and Fire Dept. work very well together for years, we were all one. Bobby always had a smile and good things to say about everyone. We had several great fishing trips with members of the Police and Fire Departments at my island on Rainy Lake and with memories that will never be forgot. God bless you Bobby. Our thoughts and prayers are with you Paul and the entire Mertens family for the loss of Bob. Throughout the years of school, sports and business, we always enjoyed how Bob was such a friendly and genuine person of character. His family is a fitting symbol of his legacy. My deepest sympathy to you Carole and family. I just heard about the passing of Bobby and Loretta yesterday. News travels slowly into AZ.b ut rest assured you are in my prayers and thoughts. Carol, I just heard about the death of Bob. It is obvious he was so engaged in the civic and the St. Mike’s community. May he be blessed for such a life of service. I have such fond memories of Bob and you and the family and your involvement in the St. Mike’s School Community. My prayers are supporting all of you in the days ahead. Special love and greetings to the “former students”! In gratitude for God calling Bobby home with that terrible form of Dementia. Thank you for Caregiving & advocating with your love, compassion ,understanding, empathy, kindness & walking him home to eternal life. This is a gift! Know that we love you & care about you & continue to remember you in our daily prayers as you renew your strength & receive comfort from God.